In June 1995 the Indonesian and European experiences was presented on the "Conference on Remote Sensing and GIS (Geographic Information System) Environmental Recourses Management" in Jakarta, June 6-8, 1995 on the occasion of the 50th Anniversary of the Independence (Merdeka) of Indonesia. This Conference was used to establish contacts to Indonesian Governmental Institutions BPPT, MOF and MOE. With assistance of Mr. Felber, GTZ (Gesellschaft für Technische Zusammenarbeit, Eschborn) test site campaigns of Sei Gohong / Tengkiling and Sungai Mansur using ground truth data collection, the monitoring process have been verified. Pass point information received by differential GPS (Gobal Positioning System) located on an environmental helicopter (EHC) helps to calibrate the new topographic maps. A Selamatan with Dayaks was held in the village Sei Gohong at the guesthouse near river Rungan between 25-28 Aug. 1995. Then Dr. Boehm flew with a small plane from Palangkaraya to Balikpapan, East Kalimantan. Ground verification were done in East Kalimantan with Dr. Florian Siegert from the Ludwig-Maximilians-University of Munich, department of Biology end of August 1995 beginning Sept 1995. 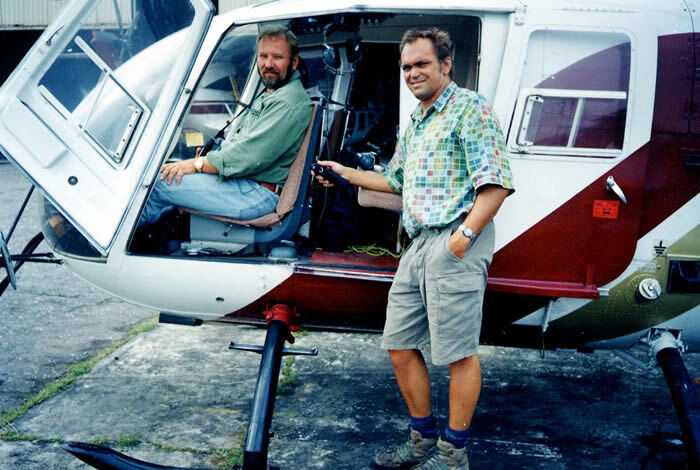 With a BO105 helicopter the region was observed by aerial survey for 6 hours started at Balikpapan and covered the three lakes and the upper Mahakam on the 4th Sept. 1995. We got fuel at the Kelian Goldmine for the helicopter. Then a long boat-trip to the upper Mahakam were envestigated with a klotok for several hours. In the Barito Pacific concession of Laham, many forest roads could be observed and the volcanic region around Kelian. 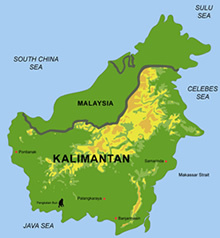 Multispectral Remote Sensing is a good technical tool to help the development of Kalimantan in a good sense. Inventory of forests and agriculture as well as controlling of concessions, artificial manmade fires, conserve ecosystems and natural resources. Regional Planing for Land Use of poor soils in the Transmigrate Program is an other advantage of remote sensing. Monitoring of minerals with RADAR Systems can be useful to find suitable locations for mining. Production of all kinds of maps with thematic informations as well as new profound topographical maps with detailed informations of rivers and mountains in a scale of 1 : 50 000. Education of people in Kalimantan is necessary to preserve the biodiversity and to explore the raw materials selectively. Contact was established between the Universities of Palangkaraya, Bogor and Samarindra partly with the help of GTZ. 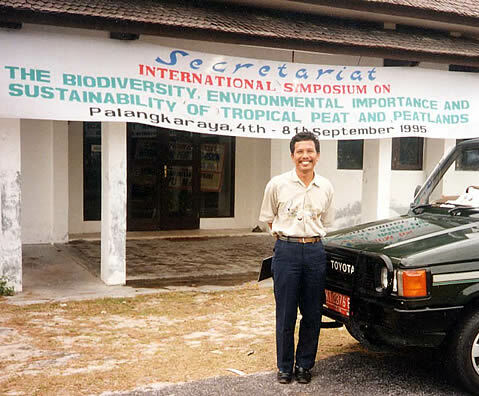 Parallel to the activities in Kaltim, in Palangkaraya took place the International Peat Symposium on "Biodiversity, Environmental Importance and Sustainability of Tropical Peat and Peatlands" between 4-8 Sept. 1995. During the flight back from Palangkaraya to Jakarta Dr. Boehm met Prof. Dr. Sieffermann, former ORSTOM head in Indonesia, in the plane. This starts the close contact with him and Dr. John Rieley from the University of Nottingham, UK and Dr. Susan Page from the University of Leicester, UK.